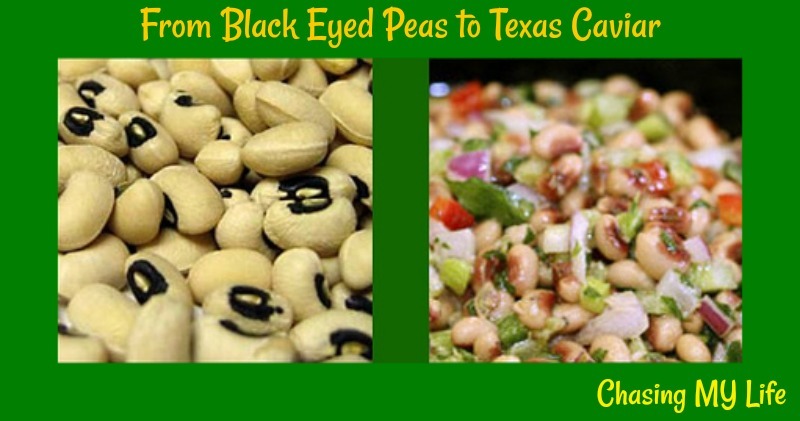 While researching black eyed peas (not an easy thing to do with a band by the same name) I ran across a reference to Texas Caviar. I read and read all those recipes and found the 2 consistent ingredients are black eyed peas and Italian dressing. So I started with those ingredients and from there added the ingredients I like most. We loved the results. We ate it for New Year’s day with fresh tortilla chips, prime rib and twice baked potatoes. Eating black-eyed peas on New Year’s Day is thought to bring prosperity. See what you think. I also found it ironic, at least in my case that since my family is from and for the majority in Texas that I had never heard of this before. Soak peas in enough water to cover overnight. Drain well. Pick out bad beans. Transfer peas to saucepan. Add enough fresh water to cover. Over high heat bring to boil. Let slow boil until tender, about an hour or so, but do not overcook. While peas are cooking chop remaining ingredients and mix well with dressing. Blend into dressing mixture and let cool. Originally black eyed peas were native to India, but widely grown in many countries in Asia, the black-eyed pea was introduced into the West Indies and from there to the Southern United States as early as the 1600s in Virginia. Most of the black-eye pea cultivation in the region, however, took firmer hold in Florida and the Carolinas during the 1700s, reaching Virginia in full force following the American Revolution. The crop would also eventually prove popular in Texas. Throughout the South, the black-eyed pea is still a widely used ingredient in soul food and various types of Southern U.S. cuisine. The planting of crops of black-eyed peas was promoted by George Washington Carver because, as a legume, it adds nitrogen to the soil and has high nutritional value. Black-eyed peas are an excellent source of calcium. Isn’t Wikipedia wonderful? I learn something every day!